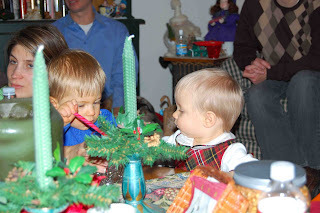 Linnea's first Christmas Eve was spent with the Branca clan at the traditional pasta feast at Great-Gramma Branca's in Rockford. 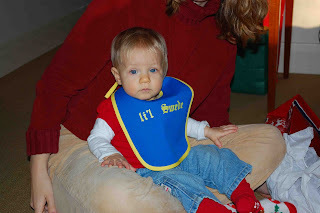 Closest to Linnea in age is Hunter, barely a year old and another adorable blondie. 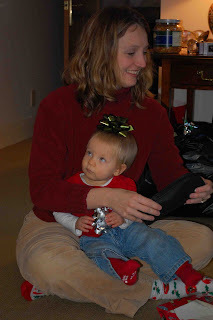 Christmas morning found us at Gramma and Grampa Daniels with gifts galore. Above she's pictured in her Li'l Swede bib from Uncle B and below, opening her blocks from Gramma & Grampa (a huge hit with both Linnea AND, unfortunately, Maya). 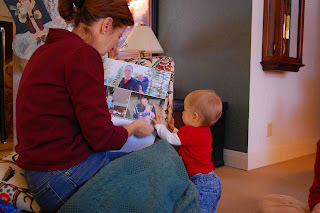 Below she's showing Gramma the cool calendar she gave her - of herself, of course. Have we mentioned how embarrassingly excited Linnea gets to see photos of herself? It's awkward. 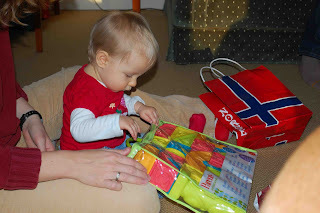 Linnea had a memorable first Christmas in Rockford, followed the very next day by a trip with the Daniels clan to beautiful Kauai. Although it took us nearly two days to get there (long story), it was well worth the trip. 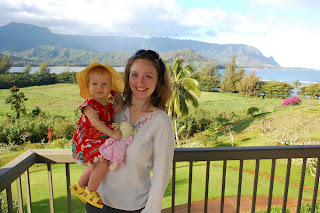 Above she's pictured with Mommy on the deck of our condo - that's Hanalei Bay and Bali Hai (yes, from South Pacific) in the background. 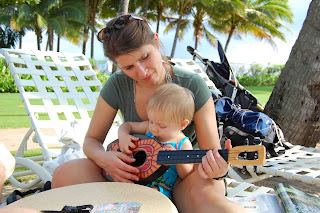 Above, she's at the lagoon, trying out her first ukelele with Aunt Aimee. 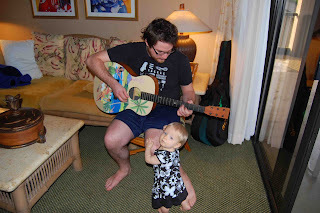 Below, she's admiring the handiwork of Uncle B on a larger (albeit still very Hawaiian) stringed instrument. 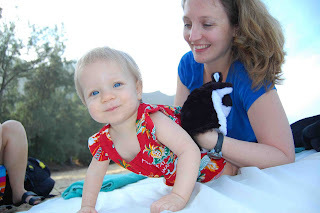 Despite the sleep traumas of the four-hour time change, Linnea still managed to soak up some sun (well covered in SPF 45, of course) and enjoy her very first departure from the continental U.S. Aloha!